I don't believe in "free will" any more than I believe in an "unfree will." Rather there are stronger and weaker wills. Changing your personality and controlling your actions are the results of a strong will. To be successful in life, you must not only envision a path, but you must also commit your whole body, heart, and mind toward your goals. Here is a model to help myself and others develop stronger wills. Consider the interface between you and the rest of the world. Very simply, there is a membrane of skin and tissue separating the inner world from the outer. Input comes in via your senses, such as vision and hearing, which then slushes around inside of your nervous system and eventually comes out as action, such as through using your hands or speaking. I have structured the internal "slushing" as a process mediated by pipes. 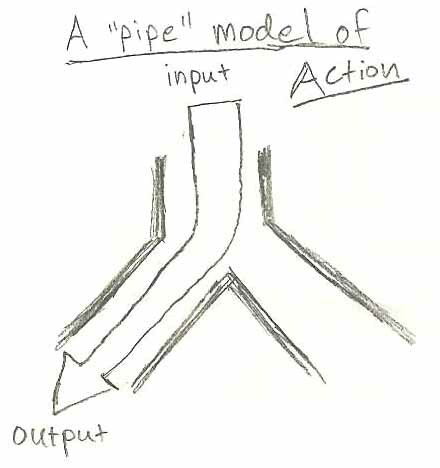 First the input comes down one pipe, then a choice is made, then finally the input converts to output and flows out another pipe. Hopefully you are happy with the last pipe. Can you control which pipe this is? 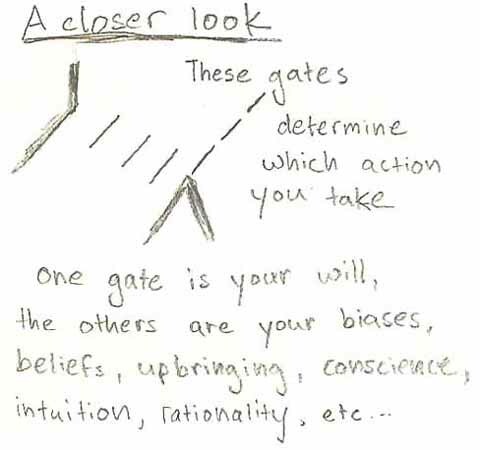 Only one gate is your "will." 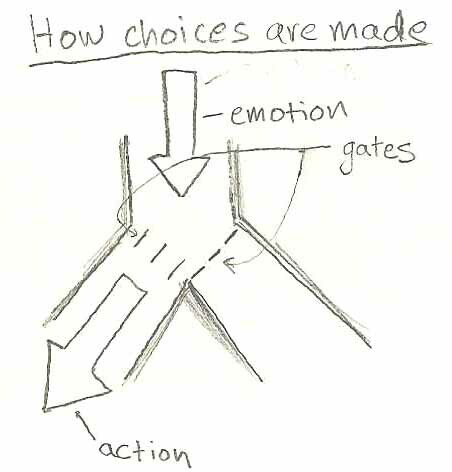 While this gate may be switched to your desired path, the rest of your body may not be rallied to your cause. This is the reason why "knowing the way" and "following the way" are often two different things. The goal is to use your "will" to unify the rest of yourself toward a particular action. You already do this on some level if you have ever tried to coach yourself, as I have to do on Fridays, "Come on Phil, do your homework. If you finish early, you'll have the rest of the weekend to party. Besides, it's easy and there's some interesting stuff in the material if you search for it." I've been told frequently to not take myself too seriously, and yet I've never been able to internalize that goal. In other words, my gates are not switched to the "don't take things seriously" pipeline. So I've developed an internal dialog (in italics below) to push me toward being less serious. 1. socratic reasoning - have an argument with yourself to internalize your reasoning behind a particular choice. Phil, don't take things so seriously, relax, don't force things, and use a light touch. Subjectively nothing is serious anyway, plus you could die at any moment and it would be a shame to have stressed the whole time. Being less serious is akin to freedom, creativity, comfort, and generates massive amounts of energy to apply yourself. 2. behavioral experimentation - use examples from your own life to convince yourself that a particular pathway is actually the best for you. Phil, remember the time when so-and-so happened and you took things too seriously and that ruined your life? Remember that other time that you didn't take yourself seriously and ended up discovering painting and DJing? 7. self-reflection - listen to your heart, see what it is saying, and learn how to work with it. Each one helps undo our habits and personality traits. 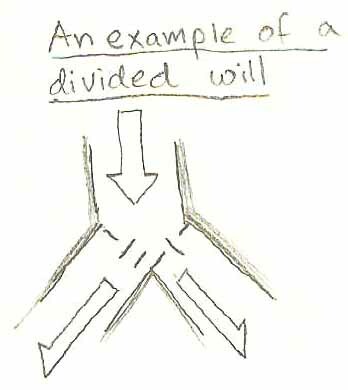 Each one is also coded for a specific type of gate. For example, #5 (use others as a model), is precisely the way you might have learnt a particular personality trait. As a child, you picked some role model that you have imitated all your life. If you use cognitive therapy, you can replace your old role models with newer, more helpful ones. To me, cognitive therapy and self-programming help me follow Yoda's imperative on personal change: "you must unlearn what you have learned"